[Agnes Zimmermann, German concert pianist and reputed lover of Lady Louisa Goldsmid.] Autograph Letter Signed ('Agnes Zimmermann') to 'Miss Glover', asking to reschedule a lesson due to 'a Rehearsal at the Albert Hall'. On letterhead of 13 Dorchester Place, Blandford Square, N.W. [London] 10 November 1894. 1p, 12mo. In fair condition, lightly aged. Folded twice. Begins:'I am very sorry to be obliged to ask you not to come to me on Monday, as I have just heard that a Rehearsal at the Albert Hall (wh. I must attend) takes place that day at 12 -'. She gives two alternative times. Zimmermann's relationship with Goldsmid was rumoured to be a lesbian one. [ Frederick Albert Mitchell-Hedges, South African explorer. ] Autograph Letter Signed ('F. A. Mitchell-Hedges') to J. H. Roberts, describing the 'strange country' of Honduras. On letterhead of the Hotel Prats ('Montado al estilo Americano'), Tegucigalpa, Honduras. 28 July 1926. 1p., 8vo. Aged and worn, with chipping along one edge, and tape repairs at head. The recipient, J. H. Roberts, was an autograph hunter: it is doubtful that Mitchell-Hedges would have written in such a style had he been aware of this fact. He states that the letter Roberts sent him 'apparently never reached the boat', and that his secretary sent it out to British Honduras: 'it has become mutilated in the post & there was nothing within except an addressed envelope'. On his monogrammed letterhead. From the Queen's Hotel, Ventnor, Isle of Wight. 12 October 1883. 3pp., 12mo. Bifolium with mourning border. In good condition, lightly aged. He wishes to explain the '2. things' he forgot in closing his letter of the day before: '1st. to mention that I enclosed a Cheque for £10 . 10s . 0d. in aid of yr. Fund for sending Poole Fishermen to see the Fisheries' Exhibition in London - & next that at the above Address I shd. be glad to receive the acknowledgment of my Cheque.' Pencil note in a contemporary hand at foot of last page: '2nd. Husband of Sir John Guests widow. (Sir J. G. 2pp., 4to. In fair condition, lightly aged and worn. With the Society's oval date stamp. He is sending as promised 'a note of the arrangements agreed upon between us at our interview to-day'. Undertaking to provide space at the Museum 'for the purpose of receiving, arranging for judgment, and re-despatching the designs submitted for the Owen Jones prizes for industrial design. The judging will be done by your nominees, and all correspondence in connection with the matter will be in your hands'. Letter from Rochester [ Kent ]; 28 September 1872. Note from St. Margarets; 20 April 1877. Both items in fair condition, aged and worn. ONE: ALS. 28 September 1872. 4pp., 12mo. Bifolium. He is 'taking somewhat of a liberty', but having heard 'that you are parting with one of your Clerks', says 'a word in favour of a person in whom for many reasons I take a great interest, & of whom you & your Brothers may know something. | I mean Mr. Prothero for many years an Inmate of my House, & an Assistant Master in the School'. Prothero was 'for some years a Clerk in the County Court', but 'is obliged from paucity of business to leave it, & is now out of employment'. Deutsch Tanagra. Porzellan-Figuren des Achtzehnten Jahrhunderts gesammelt von Georg Hirth. Munchen & Leipzig, G. Hirth's Kunstverlag. 1898. Quarto. Pages [xvi] + 159 + . Wraps lacking. Bound in worn and frayed black cloth. Loose, and on discoloured paper, with some leaves strengthened or repaired. A particular feature of the volume is that each of the more than eight hundred lots is neatly priced in manuscript, with many of the purchasers' names given. Ownership stamp of Newman & Newman Antiques, Beauchamp Place, London, on front free endpaper. [ Charles Fechter, Anglo-English actor. ] Autograph Signature ('Ch. Fechter') and authorisation of admission to '2 boxes' at the Adelphi Theatre, London. Adelphi Theatre, London. 23 December [ no year ]. On one side of a 7 x 9 cm piece of laid paper. In fair condition, lightly aged and worn; apparently cut down. Reads: 'Adelphi | Admit 2 boxes | Wed. Dec 23 | Ch. Fechter'. Good bold signature. [ E. A. Smith of the Natural History Museum, zoologist and malacologist. ] Autograph Card Signed ('Edgar A. Smith') to fellow-malacologist Rudolph Bergh of Copenhagen. On letterhead of the British Museum (Natural History), Cromwell Road, London. 11 May 1905. In good condition, with stamp and postmarks. Addressed to 'Dr Rudolf [sic] Bergh | 6 Malmogade | Copenhagen | Denmark'. Reads: 'Dear Sir, | I have no record of any account of the soft parts of Amathina tricostata since the time of H. & A. Adams. I remember your visit to us many many years ago. With kind regards | Yours v. truly | Edgar A. Smith'. Five on letterheads of the British Museum (Natural History), Cromwell Road, London. Between 1903 and 1910. The seven items in good condition, showing light signs of age and wear. Four signed 'Edgar A. Smith' and three 'E. A. Smith'. The letters totalling 10pp. A learned correspondence, with Smith attempting, not always successfully, to identify Lynge's specimens, passing comment and suggesting publications. Both on letterheads of 'The Year's Art', 34, 35, 36 Paternoster Row, London. 31 October 1916 and September 1917. Each 1p., 12mo. Both in good condition, on lightly-aged paper. Both carry the stamp and manuscript mark of the Royal Society of Arts. Convincing facsimiles of signed autograph letters. The first reads: 'In the third year of war my publishers and myself are determined to carry on "The Year's Art" without a break. | Will you, therefore, be good enough to amend the enclosed extract describing the institution in your charge, with especial reference to changed conditions. | Please notify also names (with dates of death) of any of your members or staff dying at home or abroad. Autograph Letter Signed to Dr [Albert] Gunther. American physician and explorer of Africa (1866-1939). The recipient (1830-1914) was Keeper of the Zoological Department at the British Museum, 1875-95, and Vice-President of the Royal Society, 1875-6. Two pages, 12mo. Very good, on slightly discoloured paper with a little light spotting. Traces of previous mount adhering to one edge. He is sending some 'spirit-specimens' from his collection and has written to Sir William Flower 'as to the disposition of the entire collection'. 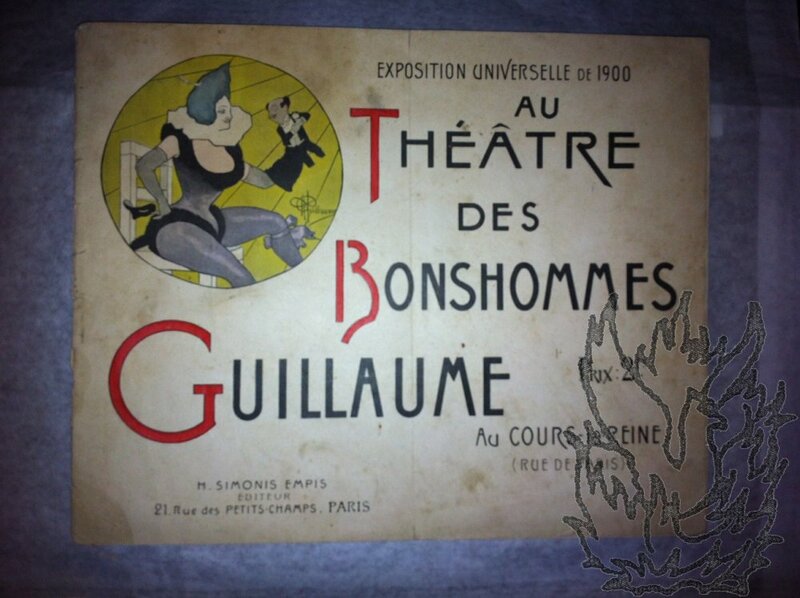 [ Printed catalogue of puppet figures by Albert Guillaume, produced for the 1900 Paris World's Fair. ] 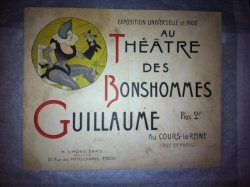 Exposition Universelle de 1900 | Au Théâtre des Bonshommes Guillaume | Au Cours-la-Reine (Rue de Paris)'. 16pp., landscape 8vo. Stapled in cream printed wraps, printed in black red, grey, yellow and blue, with caricature by Guillaume on cover showing a lady performer on a chair with a glove puppet of a gentleman. Worn and aged, with rusted staples, and wrappers detached. The sixteen pages of the catalogue are printed in light-blue and yellow on shiny art paper, and consist entirely of captioned photographs of waxworks, with no accompanying text. [ Sir Albert Spicer, Liberal Party politician. ] Typed Letter Signed ('Albert Spicer') to A. D. Snow, responding to congratulations on his receiving his baronetcy. On letterhead of 10 Lancaster Gate, W. [ London ] 9 July 1906. [ James Laver, museum curator and authority on fashion. ] Two Autograph Letters Signed (the first 'James Laver | Keeper of Prints') concerning purchases from bookseller Barry Duncan. With carbon copies of two of Duncan's letters. Laver's two letters both on Victoria and Albert Museum letterheads, and dating from 30 December 1947 and 19 March 1948. Five items, in fair condition, on lightly aged and worn paper, with slight rust staining from staple which held them together. Laver's two letters are both 2pp. long (one 8vo and one 12mo). The two relate to a collection of Dalziel wood-engravings, there being 'too many already in the Museum to justify our purchasing the collection in its entirety'. Laver suggests taking a selection of 100 engravings for £5, and with the second letter returns the residue, the price paid being £7 10s 0d. With Laver paying personally for two engravings damaged while in his care.